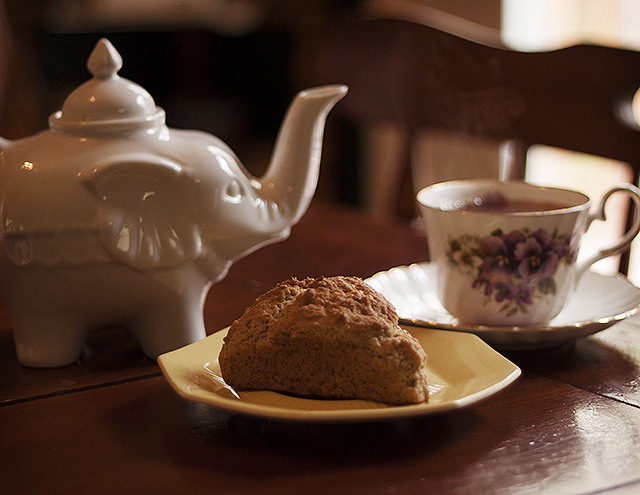 the tea conjurer: recipe: gluten free earl grey scones. Today I wanted to make scones, and fondly recalled a local tea room serving me absolutely delicious Earl Grey infused cookies. I could even see the little specks of crushed tea leaves when I took a bite, and was instantly in love. It's been years since I've eaten that baked delight, but I decided to channel my love for that cookie into a hearty breakfast scone! Good with clotted cream, jam, and/or spreadable butter! I decided to use Numi's Aged Earl Grey because I was especially fond of the fact that they don't utilize artificial flavorings, and instead used real bergamot to get that lovely flavor and fragrance! Follow the jump for the recipe & photos! I used full leaf tea and had to crush 2 TSP of the leaves into a very fine powder. If you are using bagged tea cut yours open and make sure there aren't large chunks of leaf. Use a mortar & pestle or a food processor to make a fine powder. I sifted the powder through a very fine mesh filter in order to get an even consistency. 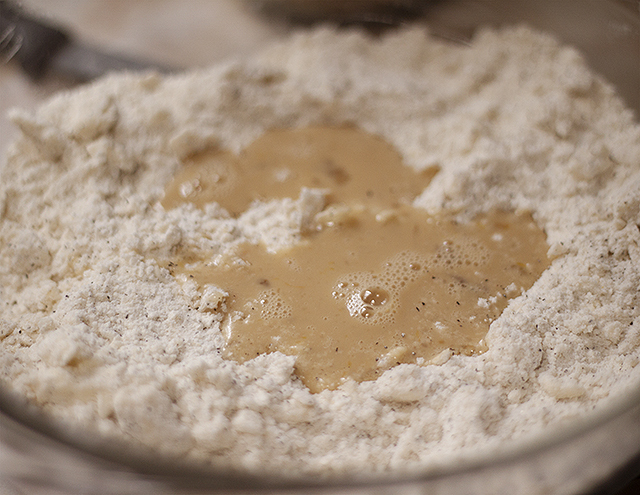 Once you get the desired texture, set it aside to be added to the dry ingredients. 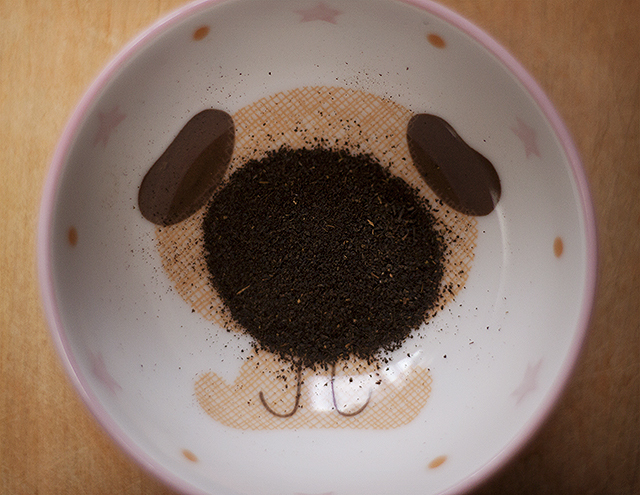 With the remaining tea leaves, pour 3/4 cup of milk into a saucepan and heat it until just before boiling point. Remove from heat, transfer to pyrex container, and add remaining tea leaves/tea bags. Let this steep for about 5 minutes while you begin work on dry ingredients. You will only be using 1/3 of a cup, but I felt more comfortable heating a bit more milk in order to prevent it from burning on the stove. Add the gluten free flour, xantham gum, baking powder, salt, sugar and finely crushed tea leaves into a large mixing bowl. Whisk together dry ingredients until the tea leaves are evenly speckled throughout. Take 1/2 cup of room temperature unsalted butter and start cutting off chunks and mixing it into the dry ingredients. 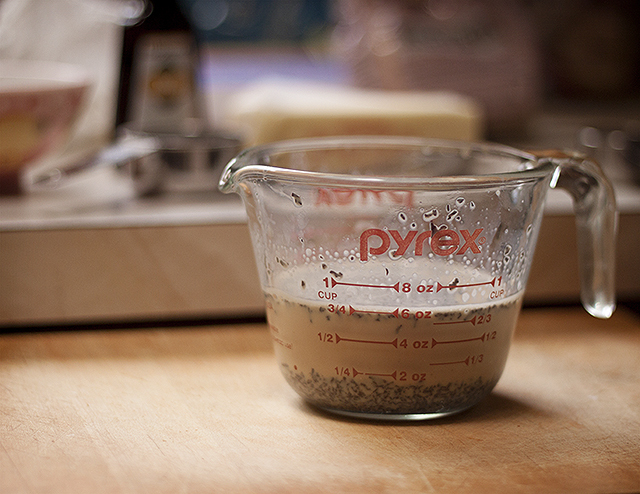 It will form a crumbly dry mixture. When the milk cools a bit and looks nice and dark (much like a strong cup of cream tea!) measure out a third of a cup, grab a strainer, and pour strained 1/3 cup milk into a bowl. Add to that bowl 2 large eggs and the gluten free vanilla extract. Whisk until it is fully blended. Start pouring the wet mixture into the dry mixture, all while stirring constantly. 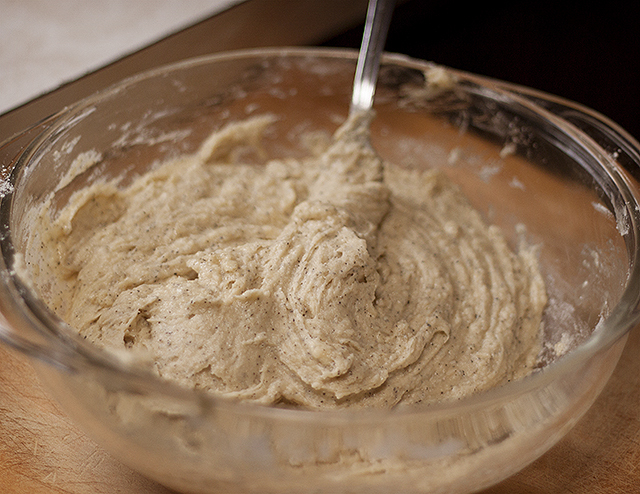 Once you get all the moist ingredients into the bowl, be sure to stir it and form a dough of even consistency. It should smell like a lovely cup of Earl Grey at this point. Don't forget to lean down and enjoy the aroma! 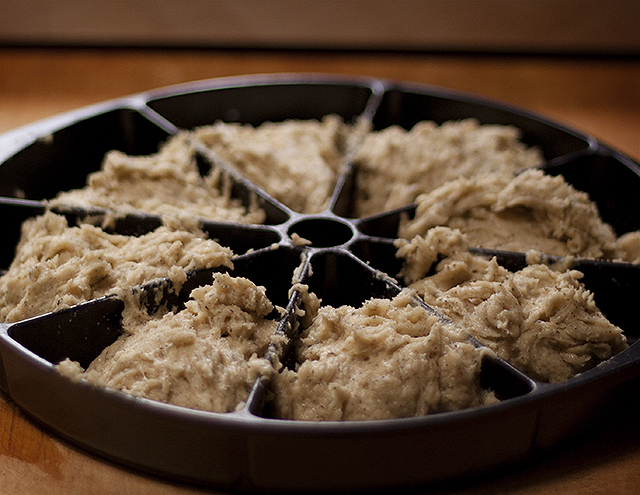 Once your dough is fully blended, start scooping out 1/3 cups and adding to a greased muffin pan, or a scone pan. I wish I could say that you could just scoop it onto a baking sheet, plain and simple, but gluten free flour needs something containing the dough together before the xantham gum truly bonds it upon baking. 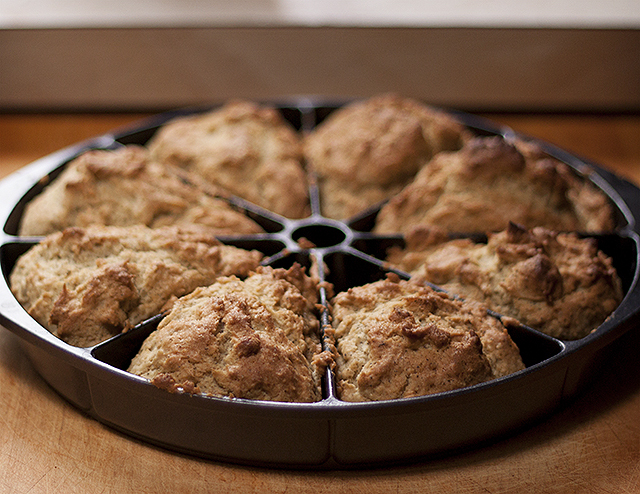 If you add the scoop of dough to a baking sheet it might flatten out or turn into a bizarre scone cookie thing. You can try it if you are lacking one of those pans, but results may very! I feel much more comfortable scooping it into a molded pan and having walls holding the dough in place. PREHEAT YOUR OVEN TO 400°F! Once you scoop the dough let it sit for 15 minutes. 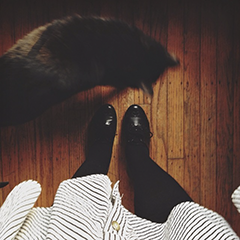 In that time be sure that your oven is preheating. Sprinkle some sugar on top of the scones. Once the 15 minutes have elapsed, put the pan into the oven and bake for 15-20 minutes, or until golden brown and crisp on top. Once you pull them out of the oven let the scones cool. Once cool, you are ready to serve! I enjoyed mine with a touch of butter (forgot to grab clotted cream) and a little bit of rose petal confit. I find that my scones stay fresh for about a week before the curse of gluten free baked goods gets to them, and they begin to spoil. If you don't think you'll be eating yours within a weeks time please be sure to freeze them and toast when ready to serve! Enjoy!